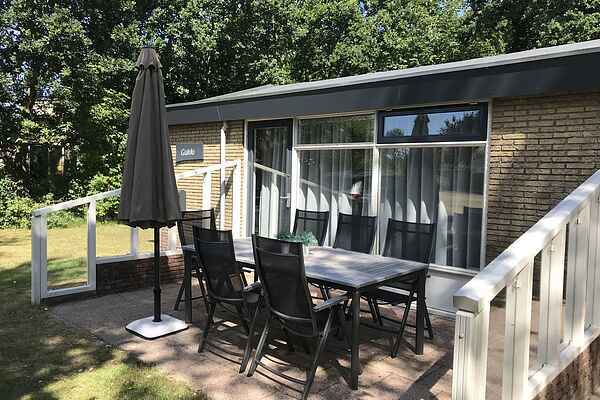 On the green and spacious layout of a bungalow park at the outskirts of the dunes of Ballum on Ameland is where you will find this bungalow offering room for six people. Behind the house start the vast forests and dunes, which actually cover the whole northern side of Ameland. From your bungalow you can walk or cycle through this wonderful nature reserve to the North Sea beach, where you can blow away the cobwebs. Although the detached bungalow is furnished in a simple way, you have everything you need for a lovely stay. The bright living room has charming furnishings and offers a view of the open-plan, corner kitchen, which is equipped with all the necessary appliances. The wooden dining table can seat six people and forms the heart of the house. The three bedrooms are also situated on the ground floor. There is a sunny, south-facing patio and the lawn around the house gives the children ample of room to play. Balllum is the smallest village on Ameland and still has an authentic village character. The village has various eateries. Besides Ballum, you will find three more villages on the island: Hollum, Buren and the capital, Nes. Ameland is 27 kilometres long and no more than 4 kilometres wide, so you can easily cycle around the island.